The unique little kirk at Kirkandrews was completed in 1906. 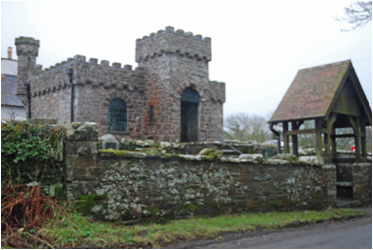 It is one of several buildings constructed by James Brown of Knockbrex in a unique style, combining influences of the Arts and Crafts Movement, Celtic motifs and a fondness for miniature castles. Kirkandrews Kirk is a popular venue for christenings, weddings and other services, and is available for use by all denominations. 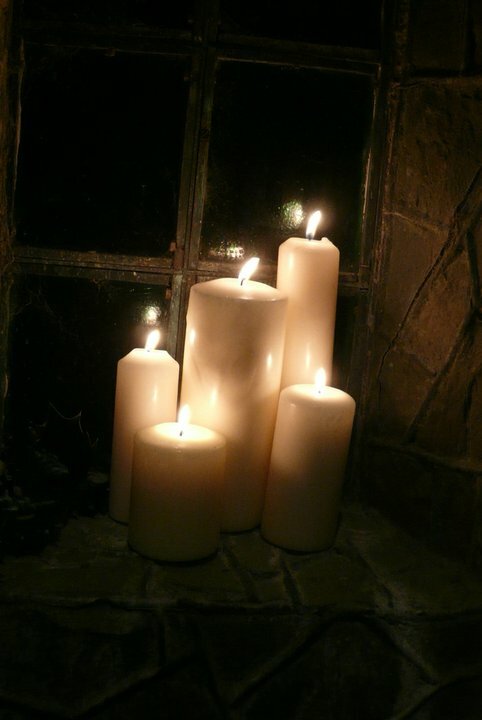 It is particularly well-attended at Christmas carol services, when the fire and candles are lit. Almost all of Kirkandrews Kirk is original. The architect was probably G.H. Higginbottom, Manchester, who designed several of James Brown’s other buildings. Whimsical features, such as the turret which conceals the chimney, are typical of his work. 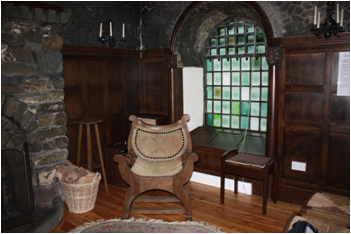 James Brown’s support for the Arts and Crafts Movement is reflected in his choice of craftsmen, including cabinet-maker Frank Hallows of Hulme, Cheshire, coppersmith James Smithies of Wilmslow, Cheshire, and pewterer W.J. Englefield of London. The only significant addition to the original fabric is the relief sculpture of the patron saint, St Andrew, made by a local artist, Jemma Montagu of Largs House, Twynholm, in 1993. This replaced the original sandstone plaque which had become eroded by damp. Kirkandrews Kirk has numerous other unusual features, including a chimneypiece with a round-arched fireplace and a castellated lintel, decorative wood panelling and columns, and windows of Norman Slab glass, first manufactured by the Chance Brothers in the 1890s and typically used in the backgrounds of Arts and Crafts stained glass at the turn of the century. “The Wee Kirk” is the only one of James Brown’s remarkable buildings which is open to the public. Another well-known one is Corseyard Dairy, known locally as the “Coo Palace”. 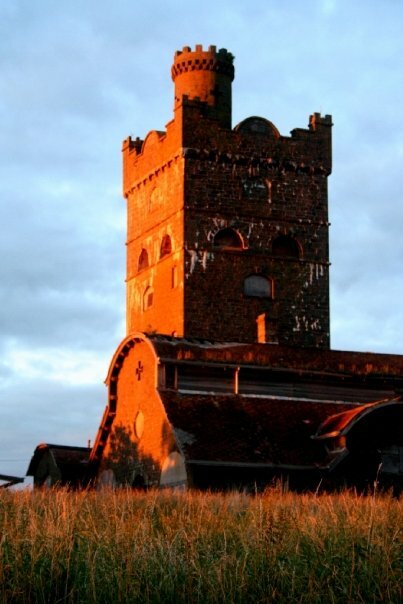 Its water-tower, designed to look like a mediaeval Scottish fortified house, is a local landmark on the coast road between Borgue and Carrick. Several other miniature castles built by James Brown dot the local landscape. Would like to thank you very much for the history lesson today 9/9/18 on your lovely church my mother inlaw Mrs Bell was over the moon and meeting up with Mrs Brown and reminiscing over old times and people . She is also looking forward to seeing you again on 20th oct for soup and cake, and also the Christmas service on 23rd Dec .